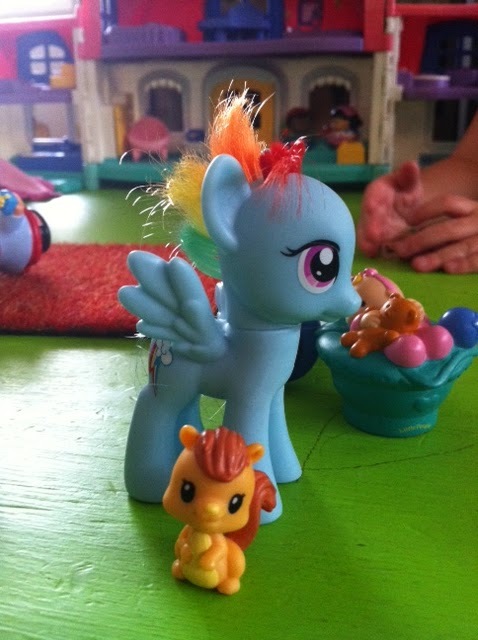 I recently bought P a My Little Pony doll. As soon as we got home P cut the pony’s hair. I asked her why and she said “because the hair was getting in her eyes and she should have it like me”. I was in awe of her response. How amazing that she feels dolls should look like her not the other way around. This has to be one of my proudest moments. I recently found an app and website called 7 Wonderlicious. It’s all about building a girl’s self esteem. They post articles on Facebook almost daily. The articles are interesting, shocking and at times freak me out. It’s really hard to develop a girls self worth with all the media surrounding them at such an early age. Much of the messages are disguised as cute toys but in reality are telling girls how to think less and seduce more. After reading some of those articles I am incredibly proud of P’s view of herself within the world. Thanks Ines! Thanks for your site, products and app! Previous Previous post: Last Day of Preschool.